It has been way too long since I posted a chocolate recipe. So, I am doing it up big today. This chocolate strawberry mousse cake is for when you need some serious chocolate therapy. Not to mention the presentation is pretty darn impressive. First, there is a thin layer of chocolate cake on the bottom. Next, a layer of whole strawberries covered with rich chocolate strawberry mousse. Then, another cake layer. Finally, the whole thing gets coated in chocolate ganache. Like I said – this is serious stuff. I recommend inviting friends over to help you eat this cake so you don’t end up in a chocolate coma trying to eat all of this yourself. I know the long list of steps in this recipe will seem very intimidating. But each step is very manageable. You can bake the cake layers one day before you want to assemble the entire cake. Just cool the cakes completely and then wrap them in plastic wrap before putting them in the refrigerator. The next day make the mousse and ganache and put everything together. The cake does require a long chilling time to set the mousse so plan accordingly. Credit for this cake really goes to my husband who made it for brunch with friends last weekend. With strawberries still in season, it was the perfect way to enjoy fresh berries while still getting our chocolate fix. The original recipe calls for a double layer of strawberries and mousse which is crazy decadent (I speak from experience). I find a single layer to be much more manageable. Lightly coat the insides of two 9 by 1-1/2 inch round cake pans with melted butter. Line the bottom of each pan with parchment paper; then lightly coat the parchment paper with more melted butter. Set aside. Place 6 ounces semisweet chocolate and 12 tablespoons butter in a microwave safe bowl and heat for 1 minute. Stir. Continue heating the butter and chocolate mixture in 1 minute increments and stirring until mixture is melted and smooth. Set aside to cool while you beat the eggs. Place the egg yolks and sugar in the bowl of an electric mixture fitted with a paddle attachment. Beat on high until slightly thickened, about 4 minutes. Scrape down the sides of the bowl and beat on high for 2 minutes more. Whisk 3 egg whites until stiff, about 3-4 minutes. Fold the chocolate mixture into the egg yolk mixture with a rubber spatula. Then add a quarter of the egg whites and stir to incorporate; gently fold in the remaining egg whites. Divide the batter between the prepared pans. Bake cakes until tester inserted into center comes out clean, about 25-30 minutes. Cool cakes in pans on rack for 15 minutes. Invert one of the cakes onto the bottom of a 9-inch springform pan. Invert the other cake onto a cardboard cake circle. Remove parchment paper and refrigerate cakes for at least 30 minutes. Select 12 of the best-looking strawberries and reserve for the top of the cake. Select 4 ounces of strawberries that are ripe but not usable whole (perhaps smaller or partially damaged). Puree the 4 ounces of strawberries to make 1/2 cup of strawberry puree. Set the puree aside and refrigerate the remaining berries. Place 16 ounces semisweet chocolate, white chocolate and strawberry puree into a microwave-safe bowl and heat for 1 minute. Stir. Continue heating the chocolate mixture in 1 minute increments and stirring until mixture is melted and smooth. Set aside to cool while you prepare the egg whites and cream. In the bowl of a mixer fitted with a balloon whip, whisk the 6 egg whites on high until soft peaks form, about 2 minutes. Continue to whisk on high while gradually adding 2 tablespoons of sugar. Whisk until stiff but not dry, about 30 seconds. Set aside at room temperature until needed. If you are concerned about using raw egg whites in your cake, see the Notes below. Whip the heavy cream until stiff. Fold a quarter of the egg whites into the melted chocolate mixture, then fold in the whipped cream. Now, fold in the remaining egg whites. Set aside at room temperature until needed. Assemble the springform pan. Arrange strawberries (not the 12 reserved for decoration) onto the cake layer in the assembled springform pan, stem side down. The berries should be arranged as tightly as possible in the pan. Try to match the heights of the strawberries, trimming down larger berries if necessary. Distribute 3/4 of the mousse over the berries, evenly spreading the top. Holding the pan by the top rim, gently but firmly tap the bottom of the pan 2 to 3 times on your work surface to remove any air bubbles. Add more mousse and tap to settle until the berries are completely covered. You may not need all the mousse – any remaining mousse may be eaten by the chef. Top the mousse with the remaining cake layer and gently press into position. Refrigerate the cake for 2 hours. Heat the cream, butter, and sugar in a saucepan over medium-high heat. Stir the mixture to dissolve the sugar and bring mixture to a boil. Place the chocolate in a stainless steel bowl. Pour the boiling cream mixture over the chocolate and allow to stand for 5 minutes. Stir until smooth. Cool to room temperature. Keep the ganache at room temperature until ready to assemble the cake. Set aside 1 cup of ganache in a pastry bag fitted with a large-sized star tip. Carefully remove the sides of the springform pan. Do not remove the cake from the bottom of the springform pan; this will make the cake easier to handle. Pour remaining ganache over the cake and using an offset spatula, evenly spread the ganache over the top and down the sides. Refrigerate the cake and reserved ganache for at least 1 hour. Remove the cake and ganache from the refrigerator. Pipe 12 evenly spaced stars along the top edge of the cake. Place a strawberry, stem side down, into each ganache star. Refrigerate the cake for 30 minutes before slicing. 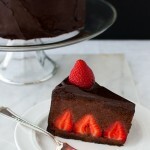 The Chocolate Strawberry Mousse Cake has a short shelf life. After assembly, this cake can be kept in the refrigerator for no more than 24 hours before serving. Beyond this, the strawberries will begin to weep into the mousse. The cake will still taste fine, but it will not be as appealing to look at. I find it easiest to buy extra strawberries so that I can pick enough that are fully ripe, unblemished and of similar size. The unused strawberries can be used for another purpose after the cake is complete. Place the egg whites and sugar into a large metal bowl. Place a small amount of water in a large saucepan and heat over a low flame. Nest the bowl over the saucepan and whisk whites briskly to minimize scrambling the eggs. Heat the whites until they reach 160 degrees. Pour the whites out of the hot bowl and into a mixer bowl and immediately begin to beat the whites until they form stiff peaks. For best results when cutting the cake, use a sharp thin knife or serrated slicer, heating the blade of the knife with hot water before making each slice. I fill a tall insulated travel mug with very hot water, then I dip the knife in the hot water and wipe the blade dry before each cut. Recipe adapted from the Death By Chocolate cookbook. Try this dark chocolate gelato. It’s wickedly decadent. Or these rich chocolate raspberry tartlets. Amazing! It was super yummy and beautiful too. i started making the cake layers today but used milk chocolate instead of dark by mistake should I start again or will it still look nice. The cake layers will be a little lighter in color but I think they will be fine. The cake layers are pretty thin in the final assembled cake. Most of the dramatic presentation comes from the strawberries and the chocolate mousse. Let me know how it turns out for you. we had the cake today it tasted nice but I must have done something wrong because the mousse was far too soft and runny. I had to make 2 chocolate mousses the first one curdled the second one I made sure it cooled down at room temperature but it was too hard to mix the cream and egg whites so I put it over a pot of water to get softer. Do you think that’s why the mousse didn’t set. I would really like to make it again but turn out the way yours is. 1. After cooling the chocolate mixture, you want it to be spreadable but still thick. He estimates the temperature to be about 75-80 degrees F, slightly above room temperature. After melting, he left the chocolate mixture near the stovetop where the pilot light keeps things a little warmer. 2. Be sure not to overbeat the egg white. If the egg whites become too dry, they won’t fold into the chocolate mixture as attractively. Another possibility is the semisweet chocolate. Commercial chocolate chips like Nestle have a different blend of cocoa products that do not re-harden in the same way as couverture chocolate. You might try a different brand of chocolate. My husband uses Callebaut but others would also work. Valhrona and El Rey are a couple of brands available in our market.